What Compels Us to Change? It May Not Be What You Think! In HBR Blog article, Ten Ways to Get People to Change, Morten Hansen compiles research on the topic of how you get leaders, employees, customers and even yourself to change. It’s a great article. Paint a vivid picture. Use images, stories, metaphors and objects to paint an ugly “before” picture of where things stand now, and a glorious, compelling vision of the “after” picture. Tweak the situation. Hansen uses the example of how Google changed where things are located in the physical flow of their cafeteria to get people to choose healthier foods. Yesterday my emotional mind was clearly running the show when I reached for that delicious Haagen Daaz bar. I’m only on the second chapter, and I’m hooked. The book starts with a study: a research team gave moviegoers two sizes of free popcorn – both way too much to eat – one medium sized and one large. They carefully engineered the popcorn to taste wretched, “one moviegoer later compared it to styrofoam packing material.” Yet the moviegoers ate it anyway. The study was designed to determine whether someone with a larger inexhaustible supply would eat more than someone with a smaller inexhaustible supply. The result: Those with large buckets of wretched popcorn ate 52% more than those with medium sized buckets – the equivalent of 173 more calories, 21 extra hand-dips of wretchedness. The ran the studies again, in different cities with different movies and the results were the same. People eat more when you give them a bigger container. 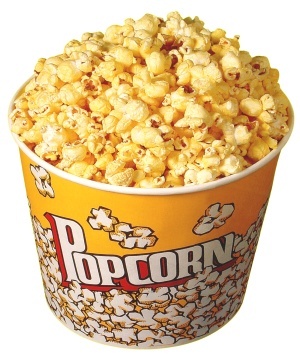 If you want people to eat less popcorn, change the situation, not the behavior. The easy way is to shrink the bucket – the hard way is to figure out how to motivate people to adopt healthier snacking behaviors. How many of our most challenging changes are situation problems and not behavior problems? What if you could change the situation (eat off a smaller plate) to make it possible for you to get the outcome you want with less effort and discipline? Well, I’m hooked. Off to read more about how I can unite the rational and emotional minds to stay clear of the Hagen Daaz. 2 Responses to What Compels Us to Change? It May Not Be What You Think! Love the article. I still want the Hagen Daaz, so I will use a smaller scoop. That’s what I’m talking about. A smaller scoop. Brilliant!! !